Grafham Water is an oval shaped reservoir nearly 9 miles in circumference surrounded by a flat landscape with no wind obstructions so giving good sailing conditions in nearly all directions and no horrible cross chop! The Eastern Area is the large grass area that you see in front of you as soon as you enter the club. Plenty of car parking and huge grassed area for rigging. Enter water via slip way. Cat Park found at the far western end of the club, turn left as you enter and follow the perimeter road right to the end. Again plenty of car parking and grass rigging area. Enter the water down a set of steps into the reservoir. The windsurf fleet is very much of the plug and play variety and we get out whenever there is enough wind to go planing but have no formal racing. 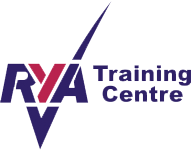 The club is now accredited by the RYA to provide windsurfing courses for adults and youths at beginner and intermediate level. Details are available here. South to SW is off shore at the Eastern end of the grounds so there is a wind shadow, so instead launch from Cat Park as this gives easy access to clean wind and great sailing. South to SE is off shore at both Cat Park and Eastern area and the least friendly wind direction for windsurfing due to the wind shadow giving gusty launch conditions. Either go big with floaty slalom kit and blast off shore in flat water or better still there is excellent sailing by the dam as the wind funnels through and you get 300m of good clean wind once you clear the wind shadow. Launch from the Eastern area and sail to the dam as this is also best to work back up wind. West and East winds give cross shore so launch from either site and the sailing is epic with waves in the middle of the lake but flat on the inside for gibing. North is on shore and best to launch from the Eastern area as slightly easier to tack up wind from here. Again excellent sailing. Look out for NW wind as this is the optimum wind direction to do the Tower Dash (see below). 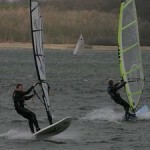 We get a wide range of conditions at Grafham and I have sailed in conditions from 9m down to 3.5m. SW gives flat water blasting with very little chop. The club has a pontoon which can be towed out and anchored at request. Just ask and it will be done. This saves having to come back to shore for a rest. The club has plenty of racing buoys which we can use if we want a gibe mark or similar. As windsurfers we often get used to roughing it however the club has excellent showers and changing facilities and are well worth taking advantage of. Good restaurant open Wednesday evenings in the summer and at weekends. Bar on the 2nd floor and a great place to relax and unwind. Look out for windy summer evenings you often get a force 3 to 4 when it’s sunny and 2 hours blasting after work can be sublime …..! On the north side of the lake opposite the Cat Park is a concrete water tower. There is an annual prize for the fastest time to leave the shore round the tower and get back to the shore. The tower is about a mile away so it’s a 2 mile dash. Under 6 minutes is good going. Either have someone time you from the start line or record it on a GPS for verification. More information here. 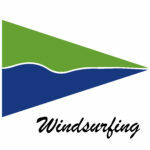 There is no active windsurf racing at the moment but windsurfers are more than welcome to join in with the Dinghies who have races on Wednesday, Friday and at the weekend. 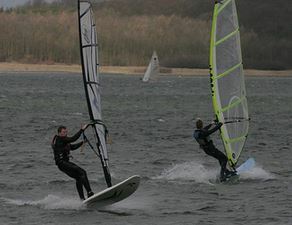 The club has several good quality 180lt and 230lt boards which are available to members to hire and are great for light wind sailing or teaching the family. These are a really good way to get out on the water if it’s not windy and to make the most of your membership. Contact the office in advance to use them.